See below: Church a Place of Affection and Accountability. In Not a Chance: The Myth of Chance in Modern Science and Cosmology (Baker Books; Grand Rapids, Michigan, copyright 1994), R.C. Sproul thoroughly addresses the logical and philosophical problems of believing in chance as the origin of the universe. 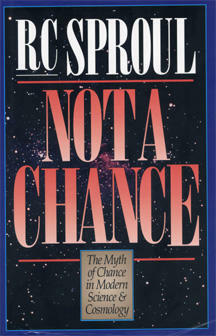 Sproul introduces his work by saying “If chance is, God is not. If God is, chance is not. The two cannot coexist by reason of the impossibility of the contrary (p.3).” The author proceeds to define his terms. He is not dealing with a mathematical study in probability. Chance, in this context, means a causal agency by which all things exist. “1. Chance is not an entity. 2. Nonentities have no power because they have no being. 4. Something caused by nothing is in effect self-created. 5. The concept of self-creation is irrational and violates the law of noncontradiction. The rest of the book pursues the proof of his thesis. Sproul is exact in his definitions and allows no equivocation. When the reader follows the line of argument, he knows exactly what the author is trying to say. This can tend towards being pedantic; however, Sproul throws in just enough humor to keep the discussion light. If the reader is confused at one point, Sproul will bring clarification just in time. Not a Chance is a great introduction to the history of cosmology and the thinkers that originated ideas or modified them. Sproul refers to the contributions of men like Aristotle, Thomas Aquinas, Rene Descartes, John Locke, David Hume, Immanuel Kant, and others without overwhelming the beginner (like this blogger). The controversy surrounding quantum physics, the theory of relativity, and other thoughts of Werner Heisenberg, Niels Bohr, and Albert Einstein is extremely informative and interesting. Sproul effectively challenges, not evolution as a science, but chance as a philosophy. He convincingly shows how the philosophy of chance undermines all hope for logic and the scientific method. The author’s arguments concerning Cause and Effect as they are applied to Bertrand Russell (famous for his essay “Why I Am Not a Christian”) easily expose Russell’s dismissal of a First Cause as weak indeed. The new student of cosmology may get lost in the sixth chapter, “Framing the Question.” The issues of “essence/substance” and “penomena/accidens” can be a stretch, but Sproul’s illustrations and examples show the reader the way out. The book seems to end abruptly leaving the reader wondering “So what? What do I do now?” This may be outside the purpose of the book, but some added thoughts for the beginner in expressing his faith and engaging the opponents of logic would have been helpful. I recommend this book highly to parents, youth workers, and pastors who inevitably will be in a position to help young people form a clear view of the world. The current age that easily accepts irrational worldviews can distract young Christians. Fortunately, we have smart people that can cut through the fog and help us. The book, Not a Chance, is written by one of them.